Whenever I'm really lucky, I get a crystalline packet of Borba, which turns my water a muddy neon green. Yum, you say!! Actually, it's a Borba packet, which, at one point, became a two-a-day habit for me (that's 4 Borbas, count 'em). And it's actually delicious. My favorite flavor, the aforementioned neon green lychee, is allegedly part of the Borba system that is "drinkable skin care." Lychee is "replenishing," and there are clarifying, age-defying, firming, and illuminating flavors. It is a bit pricey, at about $2 a packet (I can get 2, sometimes 3 drinks out of each packet), but worth it. Buy it on sale in bulk and drink your way to better skin. 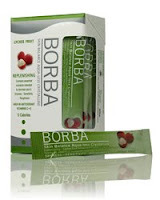 Borba is available at most online retailers like www.amazon.com, www.drugstore.com, and www.borba.com.